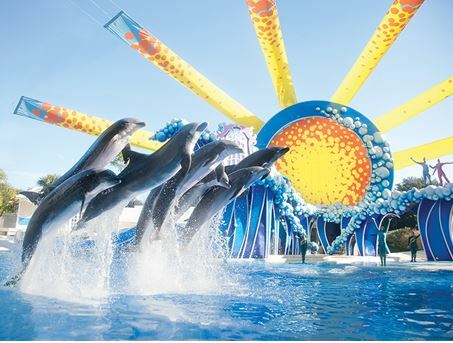 Let me start by saying I am a SeaWorld fan and am an Annual Passholder to both SeaWorld and Aquatica. I’ve lived my whole life in Orlando and I’ve seen their countless rescue efforts for over 30 years. For much of my youth I dreamed of being a dolphin trainer and excelled in science in school thanks in part to my love of the ocean due to visiting SeaWorld. But their PR and Marketing team has made a move that has left me embarrassed and flabbergasted. The #AskSeaWorld Twitter campaign I’m sure sounded like a great idea in the board room during whatever meetings transpired beforehand. Perhaps they realized that there would be a ton of criticism from animal rights groups and others, but decided it might be good to show the outrageous attacks of these groups. But it’s not the tweets, attacks, or outlandish questions from these groups that have me embarrassed. It’s SeaWorld’s response. I support SeaWorld for many reasons, the two biggest of which are my fond memories of visits all throughout my life as well as their tremendous animal rescue and rehab efforts. No other group is more prominent, especially here in Florida, when it comes to sea animal rescue. This part of the organization shows that SeaWorld cares about animals and while yes, it is a corporation that exists to make a profit (which is not a bad thing), it is an organization that does a lot of good in the world. But that goal, that aim is quickly clouded when the organization behaves in a way that appears vengeful, unprofessional, and unempathetic. 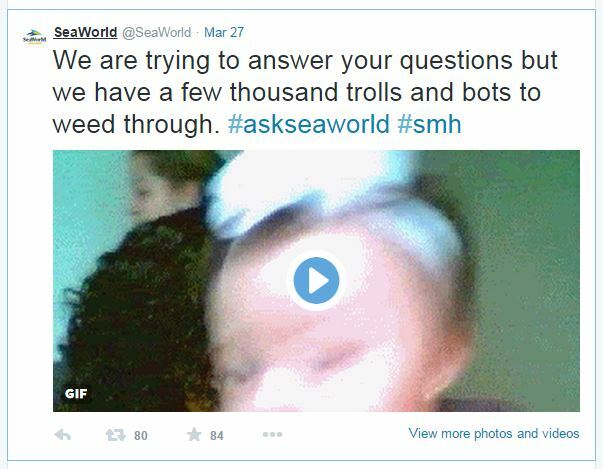 I am referring to a handful of tweets from SeaWorld’s official twitter account in response to the challenging remarks and questions they received during their live #AskSeaWorld session. 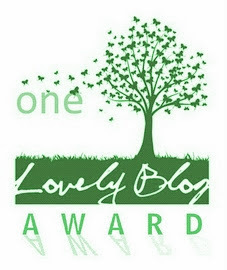 This quick Orlando Sentinel article came out just as I was putting the finishing touches on this post. It points out the reaction and amount of tweets that SeaWorld received during the #AskSeaWorld session. For me this is not the concern. Again, what concerns me the most are the three tweets from SeaWorld pictured above. When I first saw these tweets I thought perhaps that their account had been hacked. And then when I realized they were indeed legitimate I was shaking my head (#smh) in embarrassment. Using such casual language happens all the time on social media, but we the general public and especially we the SeaWorld supporters, expect SeaWorld to be the bigger person. We expect them to hold themselves to a much higher standard than those that frustrate them. In just three tweets their image becomes one of unprofessionalism and immaturity. I am sure they are frustrated with all the groups out there challenging them, but these tweets and other marketing / social media decisions they’ve made lately do not accomplish much of anything positive. The point of marketing is to be the voice of your brand and entice new & return business. 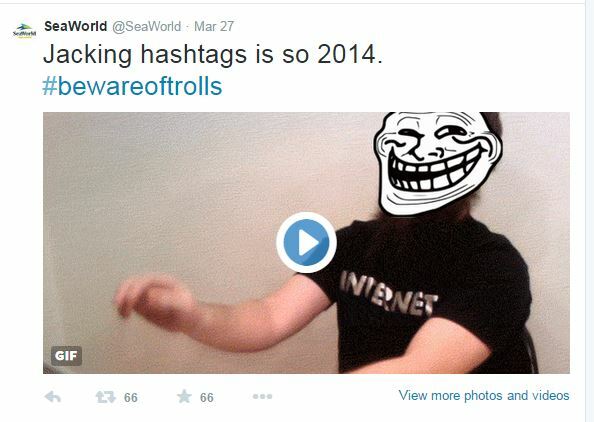 I’ve had many positive interactions with SeaWorld’s Twitter team. I enjoy the positive tweets and messages they put out there. That’s what they need to stick to. I implore and beg of SeaWorld to take the high road. Please do not make any more moves of this similar nature. Show your good side, show your best side, there is plenty of good things about SeaWorld that there is no need to stoop to this level. As a person who monitors & replies to social media posts for a very large company, I’m shocked by their responses.